Whether you want a smooth, creamy ice cream-mimicking substitute or a cool, fruity frozen juice snack, WellWorks For You has great ideas for healthy ice cream alternatives. A healthier lifestyle is always a good thing to strive for, and it will make you feel better in the long term. But sometimes in the moment, all you really want is something rich, creamy, cold, and decadent–ice cream. After you indulge, you may have some regrets, wishing you had stuck with your healthy regime. It just feels like you can’t win. Or can you? You will be amazed at how satisfying these healthy ice cream alternatives are and how good you will feel after eating them. Feeling indulgent and healthy at the same time is possible after all! When you get a craving for something cold, sweet, and creamy, you won’t have to deny yourself–try these healthy ice cream substitutes. Have you tried frozen banana ice cream yet? In recent years, this healthy ice cream alternative has become a bonafide household classic. 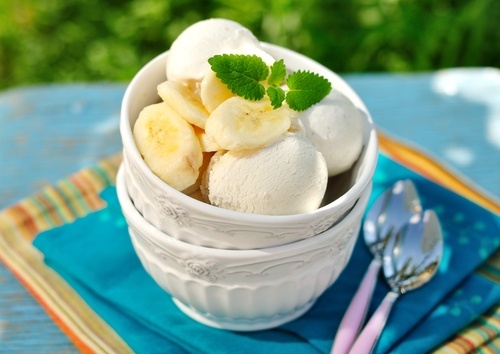 For a healthy ice cream choice, simply freeze bananas and blend them into a creamy consistency. For added flavor, we recommend dark chocolate or a spoonful of peanut butter. Did we mention that frozen banana ice cream is also a great way to repurpose those bananas that are getting a little too soft and brown to be enjoyed fresh? Cashews and cashew milk are rich, creamy, and mild-flavored. That makes them an ideal healthy alternative to ice cream. To make a thicker, denser vegan ice cream, we recommend starting with whole cashews; soak them for 12 hours, then blend with water and other select ingredients–salt, cocoa butter, vanilla extract, etc.– process in an ice cream maker, and allow the mixture to harden to a frozen, scoopable consistency in the freezer. Using store-bought cashew milk will make for a thinner, silkier consistency than whole cashews–try both methods, and find your favorite! Similar to cashew milk, coconut milk can serve as a stellar dairy substitute. Its texture is naturally comparable to milk, plus it adds a subtle coconut flavor that can be complemented by the addition of light sweeteners and flavors. You could go sweet by stirring in chocolate or caramel, or you could go fruity and add pineapple or mango. And, it’s loaded with good fats that satisfy cravings. Sometimes, you want healthy alternatives to ice cream that mimic ice cream–like the previously mentioned cashew and coconut milk substitutes–and other times, the best idea is to replace ice cream with a totally different frozen dessert. Most people have tried italian ice–but many probably don’t realize that this refreshing summer favorite can be surprisingly healthy. By freezing juice and shaving into a spoon-ready consistency or adding juice and flavor concentrates to shaved ice, you can create a delicious treat that only contains natural fruit sugars and no added ingredients! While we’re making delicious frozen fruit desserts, why not bring back a childhood summer classic and make popsicles? Mix and match fruit juices or purées of any kind — cherry, strawberry, orange, pineapple. You could swirl in some yogurt or coconut milk for a healthy take on the classic creamsicle. Just pour into popsicle trays and freeze. So simple! Let’s face it: a summer without dessert would be a pretty sad summer. But indulging doesn’t mean you have to consume lots of sugars, fats, and dairy. With these healthy ice cream alternatives in your arsenal, you’ll be able to enjoy a frosty treat in delicious, healthy style. If you’d like assistance promoting health and wellness in your life or workplace, please contact us at Wellworks For You— we’ll be glad to provide you with the effective services you need. (P.S. Want more recipes? Check out our Recipe eBook (with a bonus food journal)!